The Jon Menges Group is a mainstream jazz ensemble that performs various styles of standards, jazz classics, and original tunes. The group has played in many cafes, bars, restaurants, bookstores, and for private functions in the New York area. Also providing various styles of swing and Latin music, the group can perform as a trio on up. A trumpeter, composer, arranger, and music copyist, Jon Menges’s creative and talented musical programs delighted the audiences in the Chicago area for many years. Jon has performed with such great artists as Cab Calloway, Lou Rawls, Neil Sadaka, Leslie Uggams, Joel Gray, Jim Nabors, Freddie Cole, and Jon Faddis. As well as having traveled all over the world playing shows on cruise ships, Jon toured the country with the orchestras of Russ Morgan and Guy Lombardo. Jon also did a U.S. tour of the Broadway show Copacobana. 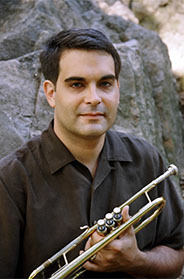 Today, Jon resides and freelances in the New York City area as well as teaching music in Connecticut. Copyright © 2007 MengesMusic Inc.